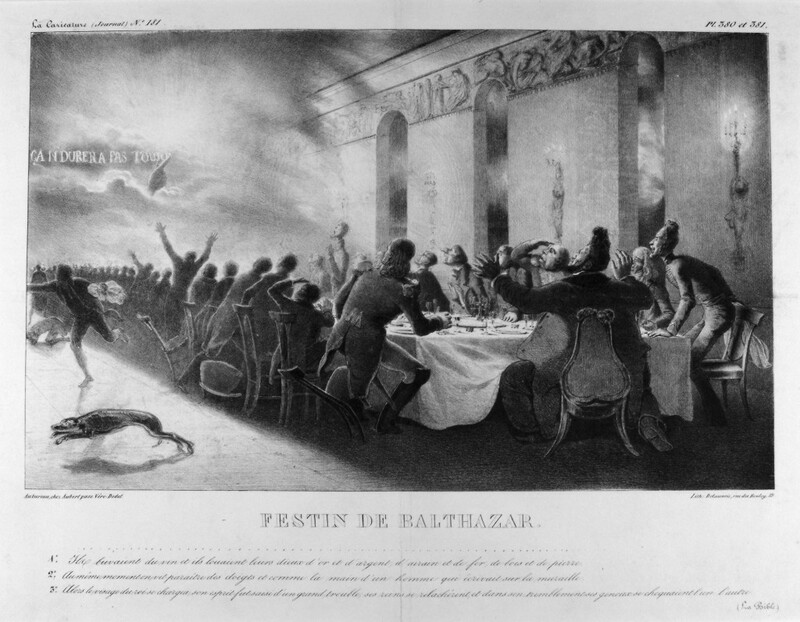 Belshazzar’s Feast is a satirical lithograph created by French artist Charles Joseph Travies de Villers in 1834. The piece is based on Rembrandt’s Belshazzar’s Feast, which depicted the king of Belshazzar and his guests at a feast. Rembrandt’s work in turn portrayed the scene of Belshazzar from the Bible. The work of Travies was produced four years after Louis-Philippe came into reign and discontent of the government within those few years can noticeably be seen in his portrayal of the monarchy and his council. At the point in time that the lithograph was made, France was working towards stability. For nearly a half-century, the nation underwent destruction during the French Revolution and Napoleonic wars spanning 1789 to 1815 (Hunt, 2004). In the aftermath of such desolation, Louis XVIII was named as the restoration King, only to die while in reign in 1824. Charles X, the brother of Louis XVIII, took the seat as the King of France for a short six-year reign until he abdicated in 1830. Louis-Philippe took the throne after Charles X and advocated his liberal policies while adopting the title of “King of the French” (Price, 2007). At first he was very much loved and supported, but Louis-Philippe’s government strayed from its liberal foundation and became increasingly more conservative. His regime saw the crumbling of working conditions as well as a widened income gap, leading to an economic crisis in the last year of his reign. The horrific economic crisis that led to rebellion was rooted in five Parisian banks closing within the decade as well as nearly fifty mills closing in Mullhouse, a leading industrial capital (Dunham, 1948). As Dunham addressed it in Unrest in France, “the Revolution had not caused the crisis. It merely intensified a crisis that already existed.” Needless to say, Travies found humor in Louis-Philippe’s situation was in and wanted to publish his work in La Caricature, a satirical Parisian paper that did not always have the support of the government because of its censorship violations. To analyze Belshazzar’s Feast, an understanding of the original reference needs to be established. The feast of the king of Belshazzar is first mentioned in the Book of Daniel. In addition to the verses written at the bottom of Travies’s lithograph, Daniel states that Belshazzar is to have “profaned holy vessels looted from the temple.” The king of Belshazzar and his guests interrupted at their feast by the hand of God spelling out a phrase that loosely translates from Hebrew into “This will not last forever” (KJV, Daniel 5:1-4). Around 1636, Rembrandt portrayed this scene in his painting suitably titled Balthazar’s Feast. Rembrandt’s work, more so than the Book of Daniel, served as the primary influence for Travies’s satire on the story in relation to France’s politics occurring at the moment (Colby). In the Bible and Rembrandt’s work, the hand of God was foretelling the downfall of Balthazar’s reign, his death, and the approaching elimination of his empire (Bomford et al.). This foretelling can also be applied to Travies’s work in which God is warning Louis-Philippe of his downfall that will come about due to the revolution of 1848 (Colby). His demise, which was predicted in Travies’s work, came about because of the disapproval from citizens as the government gradually became conservative and Socialists began to revolt (Dunham). The frequent use of the feast of Belshazzar in many artistic depictions of demise give way to the potential of Travies’s painting being compared to modern films. The aspect of the feast in Belshazzar’s Feast represents a lavish occurrence that soon becomes, in a way, the last supper. Such transformation is reflected in Scott and Tucci’s Big Night. The theme of these two works demonstrates the materialistic value people place on events and how that acts as a distracter to the detrimental reality awaiting them, which can ultimately result in failure. In Big Night the two protagonists, Primo and Secondo, prepare a grand feast to save their failing authentic Italian restaurant. After preparing a feast for the guest of honor, in Travies’s work the “guest” of honor would be Louis-Philippe, there is a warning that their restaurant would soon be foreclosed because there would be no redemption. The happiness of Primo and Secondo’s reign over their kitchen would be dampened by the looming of foreclosure in the future. Similarly, the warning of failure evidently shocked Louis-Philippe in Travies’s work. The significance of food in both of these works highlights the strong opposing forces that feasts present. In one aspect there is an extravagance about the entire ambiance of the situation, as feasters nearly bathe in the luxuriousness of the feast. On the other hand there is a deterioration of identity and confidence that can suddenly transform the motive of the feast into the deprivation of richness and culture. In a beautiful manner, both Belshazzar’s Feast and Big Night demonstrate the conversion of one extremity of feast to the other. Big Night. Dir. Campbell Scott, Stanley Tucci.” Rysher Entertainment: 1996, Film. Bomford, D., Brown, C., and Roy, A.. Art in the Making, Rembrandt. London: National Gallery Publications, 1988. Print. Colby, Robert. Personal Interview. 23 09 2010. <http://www.ackland.org/art/collection/search/Result.php?accession=2000.10.6&gt;. Daniel. The Holy Bible King James Version: 1611 Edition. Hendrickson Publishers. Dunham, Arthur. “Unrest in France in 1848.” Journal of Economic History 8. (1948): 74-84. Cambridge University Press, 1948. Web. <http://www.jstor.org/stable/2113565&gt;. Hunt, Lynn Avery. Politics, Culture, and Class in the French Revolution. University of California at Berkeley, 2004. Print. Price, Munro. The Perilous Crown : France Between Revolutions, 1814-1848. London: Macmillan, 2007. Print.